When it comes to camping, being able to camp in an area as beautiful as Santa Barbara, California is probably about as close to paradise as it comes. 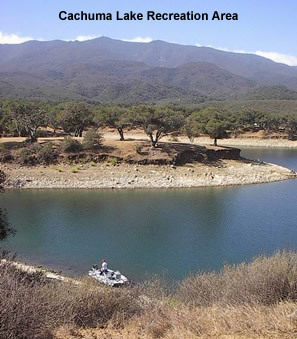 The Cachuma Lake Recreation area, one of Santa Barbara's county parks, is a great place to camp year round whether you tent camp, have a trailer, or a Class A motorhome. There are over 400 campsites; 90 have full hookups (electrical, water and sewer) and 38 have electrial and water. And, if you want to camp but don't have your own camper, there are yurts and cabins available for nightly rental. The single family campsites are all first come first served and are not reservable. Each site has a picnic table and barbeque pit; with showers, restrooms, and water nearby. There's also an RV dump station available. 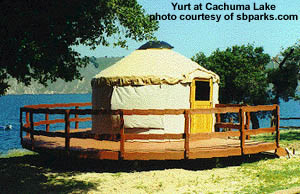 Yurts are reservable and can be reserved up to six months in advance by calling 805.686.5050 Monday through Friday from 10 am to 2 pm Pacific time. Group camping is also reservable at this number up to six months in advance. Dogs are welcome but there are some requirements and restrictions. First of all, there is a $3 daily fee for dogs; plus proof of current rabies vaccination has to be shown upon arrival. Dogs have to be on a leash of 6 feet or less at all times they are outside the camper or tent and are not allowed within 50 feet of the shoreline or in boats. Cachuma Lake Recreation Area is located at HC 59 - Highway 154, Santa Barbara, California. 20 miles north of Santa Barbara and about 14 miles southeast of Solvang (a picturesque Danish town). For more information about Cachuma Lake, visit their website or call 805.686.5054 to hear recorded information. To see a slideshow from Webshots that someone took on a visit to Cachuma Lake and nearby Solvang, click on the image below.